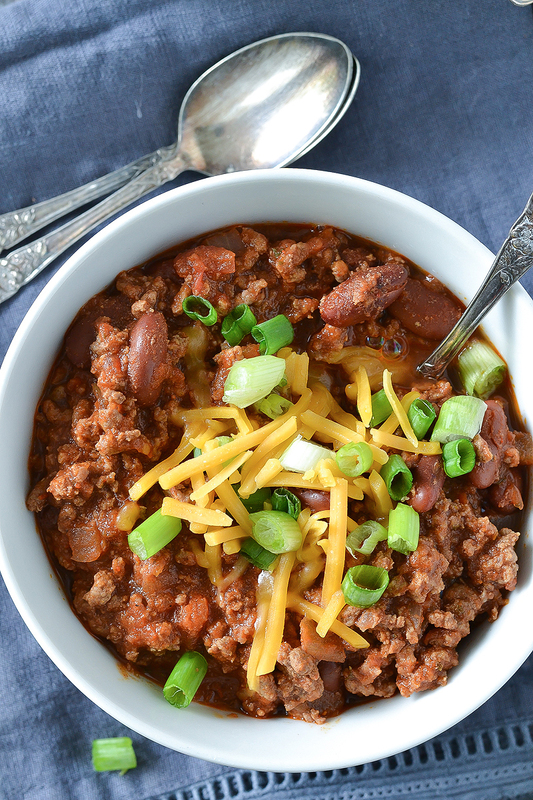 An easy recipe for thick and hearty Slow Cooker Chili. Perfect for a “chili” day served with a loaf of fresh bread! I love a good bowl of chili! Here in Buffalo the temperature is only in the 40’s! Yes my friends fall is in the air! If you’re looking to find some fall weather, then Buffalo is the place to be. It’s refreshing and come February 40’s feel like a heat wave! A warm bowl of soup or chili is one of my favorite things to curl up with on chilly days like this! Earlier I shared my easy recipe for Big Batch Homemade Chili Seasoning. I absolutely love having this on hand along with a few other favorite including taco seasoning, Italian seasoning and ranch. Chili seasoning is good not only for chili but great in burgers, on baked potatoes or even nachos to name few. 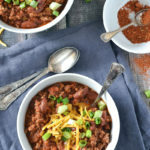 Once you whip up a batch of my homemade chili seasoning you’ll have it on hand for at least 3 or 4 pots of chili, including my recipe for Slow Cooker Chili. 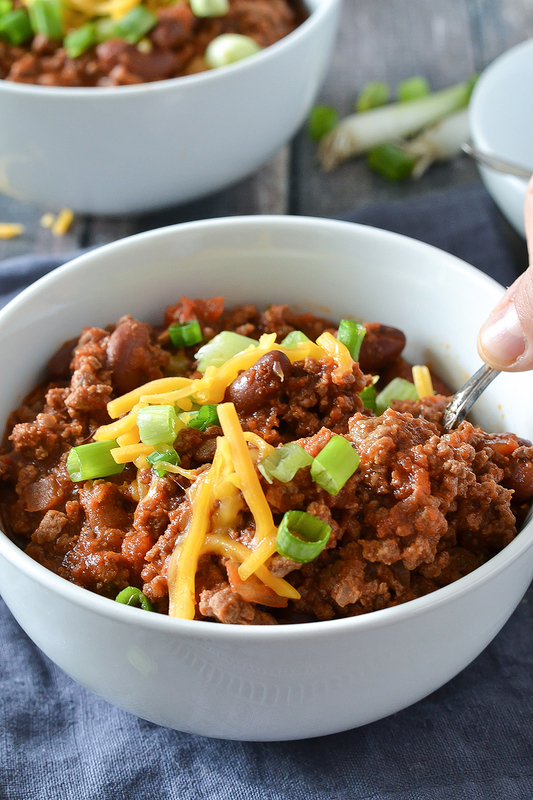 This is a classic Slow Cooker Chili. Simple and delicious. It’s pure comfort food along with a loaf of fresh bread. 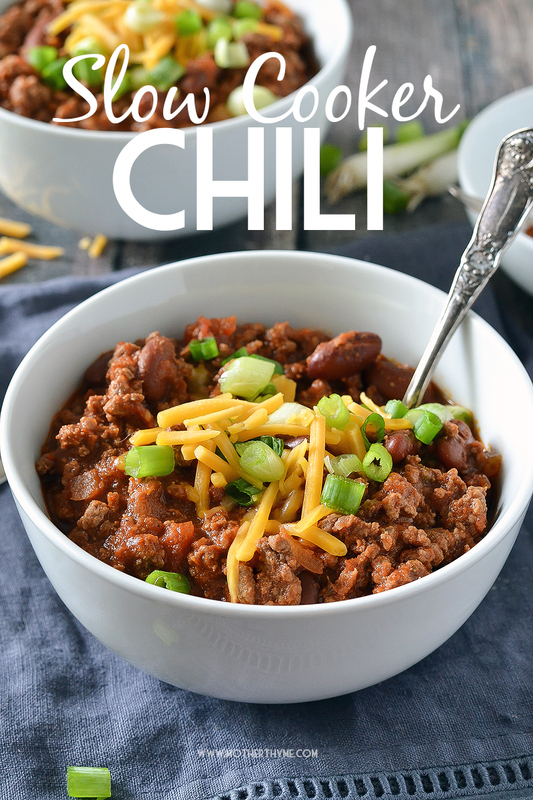 I love making chili in the slow cooker because I can toss it all together in the morning and come up to a warm bowl of chili at the end of the day. No worries about cooking, no worries about a ton of dishes. Easy peasy! I use the Crock Pot 5-in-1 Multi Cooker which I love and you probably hear me rave about all the time! I’ve had it for years! I can brown my ground beef mixture for this chili right in the same pot without getting another skillet dirty! If you don’t have it, no worries! Just brown your ground beef mixture as I outline in the instructions below then transfer to your slow cooker. All month long I have been celebrating “crock-tober” on my Facebook page. Every day I’m sharing one of my favorite slow cooker recipes. If you love slow cooker recipes as much as I do make sure you’re following along! ALSO, there’s currently a giveaway going on for a Crock Pot Casserole Crock that’s perfect for all your holiday entertaining. It’s super cool! Click HERE to check it out and to enter! Giveaway ends Saturday night so be sure to check it out! And if you’re not already signed up for the Mother Thyme emails be sure to sign up so you get all my latest recipes delivered to your inbox PLUS if when you sign up you’ll get a FREE slow cooker eBook that’s only available until October 31st! Click HERE to sign up for Mother Thyme emails. 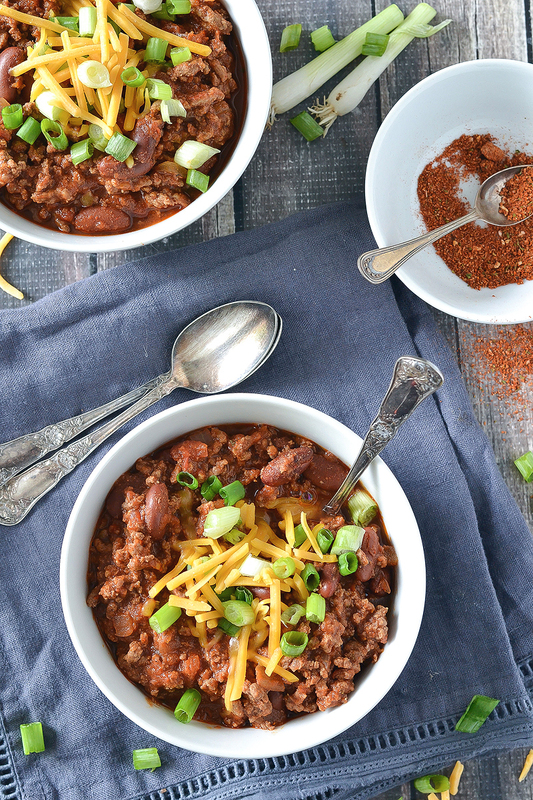 An easy recipe for thick and hearty Slow Cooker Chili. Perfect for a "chili" day served with a loaf of fresh bread! In a large skillet brown ground beef with onions and 1 tablespoon of chili seasoning. Transfer browned beef mixture to slow cooker. Add crushed tomatoes, tomato sauce, kidney beans an 2-3 tablespoons of chili seasoning (depending on how spicy you like it.) Cover and cook on low for 6-7 hours or high 3-4 hours. Served topped with shredded cheddar cheese and green onion if desired. Click HERE for my recipe for Big Batch Chili Seasoning.